Picked up a couple of years ago - RC Signals "Jimmy"
While on vacation a couple of summers ago in the Penetanguichene ON region I wandered into a second hand store. 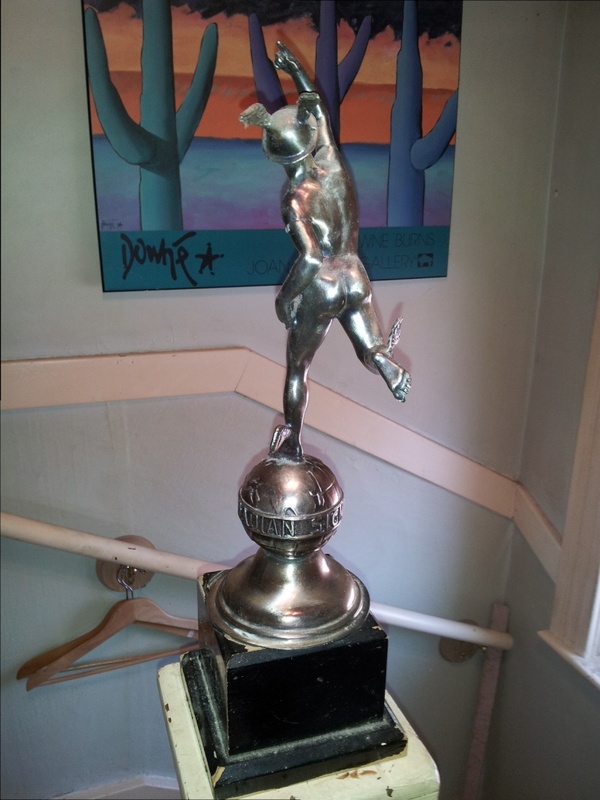 I wasn't really expecting find much ... then I noticed a winged foot statued fellow on a trophy type base. The next day was a Militaria/Gun show - maybe the big fall show in Etobicoke, ON and I took it down there. I met a fellow who kew about them - he offered me $ 50 which I politely refused. He told me - if memory serves - that they are called Jimmies - not sure of the spelling - and are given out by the Royal Canadian Singnals for various things. 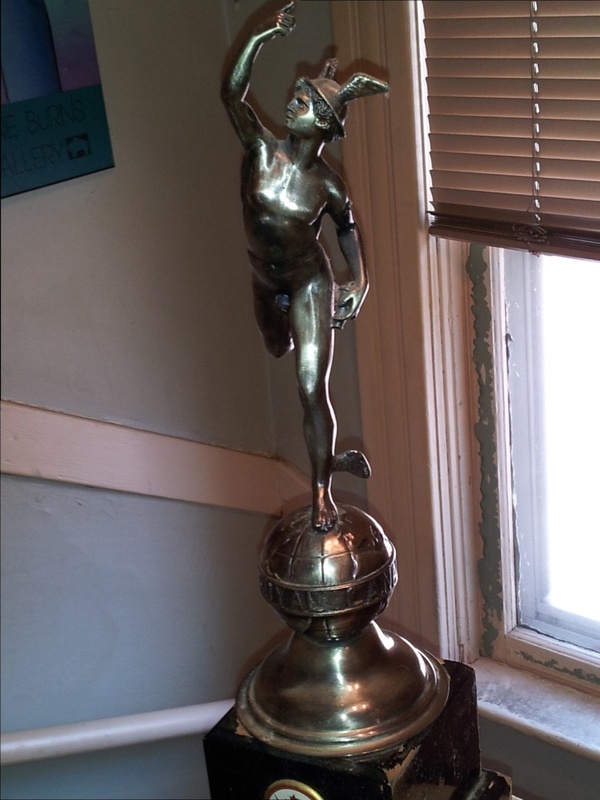 I think he also said that there are a couple of styles for the statue and this was the older style. I should have paid more attention at the time. I think it is made of sterling and though a little tarnished is in very good condition. The base doesn't really fit and it looks like a plate was removed from one of the sides - maybe a name plate but I really don't know. edit - Royal Canadian Signals goes around the center of the globe - edit. Anyone have any more more info on on it - I use it to hang memory sticks and other stuff - quite handy. Re: Picked up a couple of years ago - RC Signals "Jimmy"
Very cool! I've seen one of those somewhere around here...can't recall where though. This is an interesting item. Do I see a Canadian Forces Communications Command badge? It is barely visible in the first photo. If so IIRC this would date this sometime between 1970 and the mid 90's?? Yes, I think so. 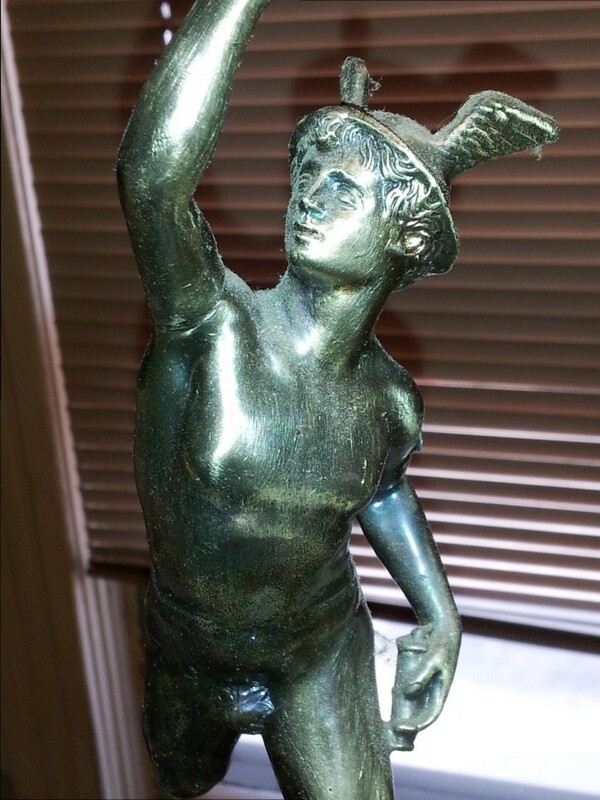 i have been told that there are a couple styles of the statue and this may be an older one.